Thirukazhukundram temple is popularly known as Pakshi Thirtham which is located close to Mahabalipuram, on a hilltop, in the District of Kanchipuram of Tamil Nadu, on the Chengulpet-Mahabalipuram road. The temple at the foothills is dedicated to Thirupurasundari Amman, Parvathi, the consort. Many of the visitors to Mahabalipuram also visit Thirukazhukundram Vedagiriswarar temple since it is just 15 kms away. According to tradition, the four Vedas, Rig, Yajur, Sama and Atharvana, are seen here in as four boulders, placed one above the other, with Lord Siva as Vedagiriswarar, emerging from the head of the fourth Veda, Atharvana. The presiding deity is Vedagiriswarar (Lord Shiva, a swayambu lingam, built of three large boulders, constituting the three walls for the sanctum. The hilltop of Thirukazhukundram Temple can be reached by ascending 562 well-laid stone slabs. On the way there are small mandapams, for pilgrims to rest. Those who are unable to climb can take the help of dholis, which will be carried by two people, for a nominal charge. 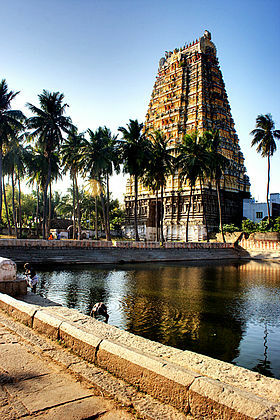 The temple has four gopurams, the tallest with nine tiers on the southern side, and the other three with seven tiers. The uniqueness of this temple is the daily visit of two eagles happening for centuries. They come down to a rock where sweet rice (sakkarai pongal)is offered as food by the priest after the pooja. They eat the sweet prasadam and after cleaning their beaks in the water kept in a small vessel nearby, take off, circle around the tower again and fly off. According to legends, these two kites are rishis who were cursed by Lord Siva, are coming there to pray the Lord to get out of their curse. Near to the temple, Sanku Theertham, a sacred tank is located opposite to the temple, extending to 1,000 square yards area, with wide steps on all sides. According to Sthalapuram, this tank is the most sacred tank, and all the sacred waters in India meet here once in 12 years when Guru (Jupiter) enters Kanya rasi. This event is celebrated as angu Thirtha Pushkara Mela which is attended by large crowds of people. It is believed that the hill has innumerable medicinal herbs and plants and therefore the cool breeze is said to cure ailments. As the Vedas exists as Hill - it is believed that undertaking circumambulation of the Hill gives effect equivalent to worshipping the Vedas. There are 12 holy water tanks around the hill - 1. Indra Theertham, 2. Sambu Theertham 3. Rudra Theertham, 4. Vashishta Theertham, 5. MeygyAna Theertham, 6. Agasthiya Theertham, 7. Markandeya Theertham, 8. Kaushika Theertham, 9. nandi Theertham, 10. Varuna theertham, 11. Agalikai Theertham, 12. Pakshi Theertham. Thirukazhukundram is 70 km away from Chennai and 15 kms from Mahabalipuram. Buses are available from both these places.